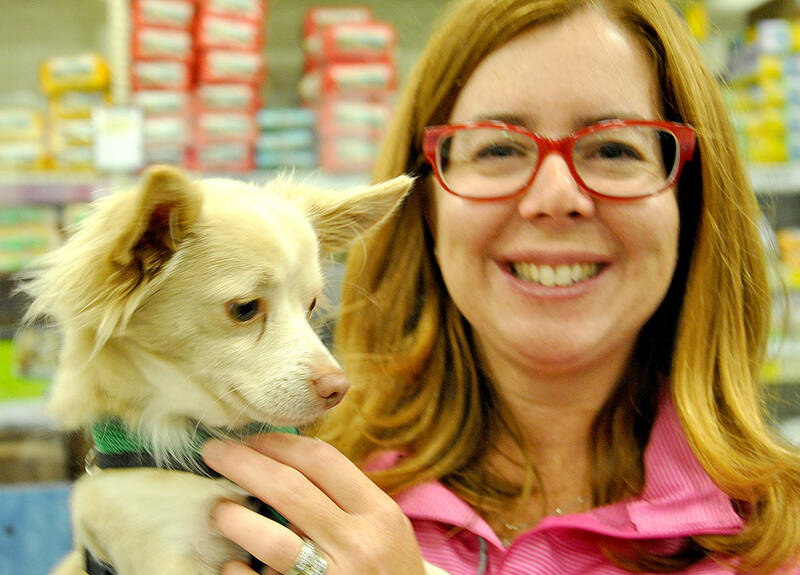 A U.S.-based animal rescue centre is back at Langley PetSmart this weekend. Oct. 10, 2017 7:00 p.m.
How dare her husband, Rob, think that she would go against his wishes and consider adopting another dog without consulting him first. After all, she said, she was just going to volunteer for four or five hours, to help Embrace a Discarded Animal Society run an adoption clinic at the PetSmart on the Langley Bypass. After explaining the situation, Fraser then confessed that Rob’s concerns might held some validity. Five years ago she adopted a chihuahua-wiener dog cross named Abby from California. That dog had been rescued from Los Angeles, where police discovered her next to her owner who had been deceased for five days. “Just because I got one before,” why would her hubby assume now that she’d bring home another dog without first talking to him. But, that’s exactly what she did. Back in May, Fraser brought home Stella, a year-and-a-half-old, five-pound chihuahua. She added: “I had no choice. I had to defy my husband,” noting she tried to sneak the dog into the house inside her T-shirt. “But her head just kept popping up,” Fraser chuckled now, admitting she hadn’t really thought through her plans for hiding the truth from her husband beyond just getting Stella in the house and getting her settled. Then, she hoped, Rob couldn’t say no. But last month, while volunteering for Embrace again, she admitted that she had considered rescuing yet another small dog from the U.S.-based animal shelter, which sets up an adoption clinic in Langley on average once a month. “I’d probably ended up in divorce court,” Fraser said, if she seriously considered adopting another dog. “I know there’s absolutely, positively no…” her train of thought fading off. 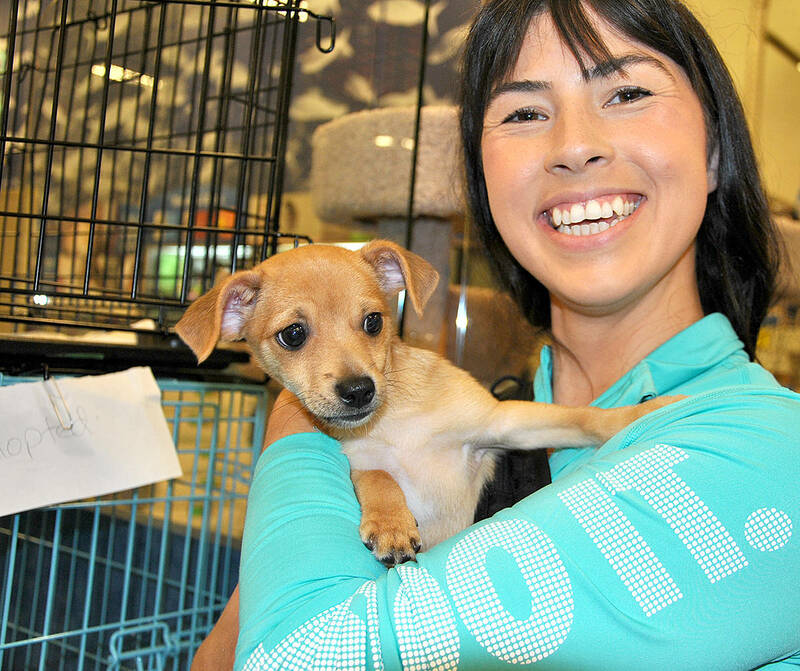 “I just fall in love with those sweet souls,” she added, cuddling another chihuaua, named Paisley, in her arms at the most recent adoption clinic. Now, when Fraser adopted Stella back in May, Embrace operator Leslie Fee demanded she make a promise. She had to vow to continue volunteering – otherwise the adoption was off. So, as promised, Fraser was back as a volunteer at last month’s adoption clinic in Langley. And again, she’ll be back this weekend. The next adoption clinic is happening Oct. 13 to 15 at the Langley PetSmart store at 200th Street and the Langley Bypass. Embrace a Discarded Animal Society is an adoption shelter based out of Blaine, Wash. The facility was set up across the border in the U.S. about two years ago, when Leslie Fee was able to purchase a 10-acre property for pennies on the dollar compared the Lower Mainland. Prior to that, Embrace operated primarily with foster homes. But now, Fee said, the dogs are cared for on the ranch that has kennels and lots of room for the animals to run. Leslie and her husband Ralph goal is to fill a need to find homes for small dogs, so people weren’t going to buy from puppy mills. While most of the dogs in care at Embrace are from California, there are some from Taiwan, and the society was expecting to take some of the dogs from overflowing shelters in the hurricane devastated Texas. Dogs are never adopted “off the table,” Fee explained, noting that any potential adopter must be screened – complete with a home visit. “We don’t want people coming in expecting to just pick out a dog,” she said. She and her husband have been running frequent adoption clinics for the past year in Abbotsford, White Rock, and Langley. During these visits, they typically receive about a hundred applications, she said, noting that following the September stop in Langley, Embrace approved 17 adoptions. 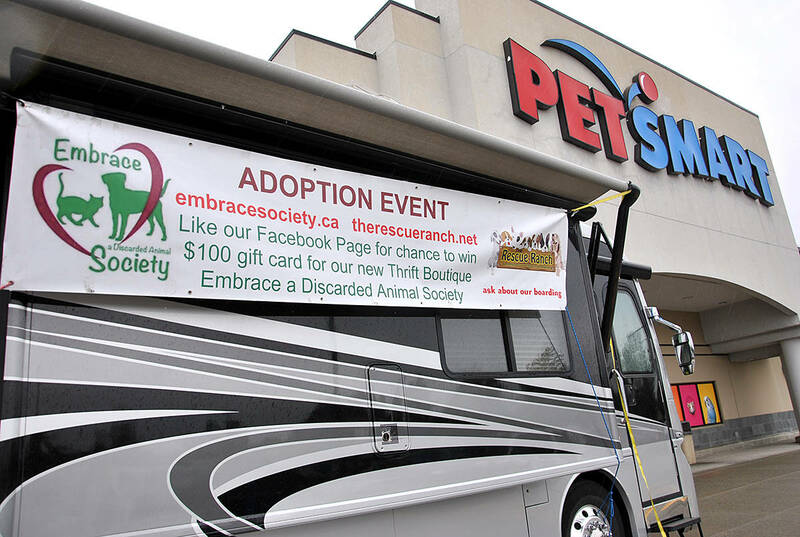 They’ll be pulling up in front of the Langley PetSmart again this weekend, with their large, customized motorhome, dubbed the Rescue Express. It is outfitted specifically to transport the dogs. For more information, visit the Embrace website. Can you run in a costume, Langley?